The South Carolina Military Museum traces the state's more than 400-year military history. Telling the story of soldiers is never easy: sticking to the truth while honoring those who set the standard for selflessness and service for a community, a state, a nation. Mix in South Carolina’s rebellious history and you’ve got an even more difficult time telling the story of a state whose residents fought for and against the U.S. 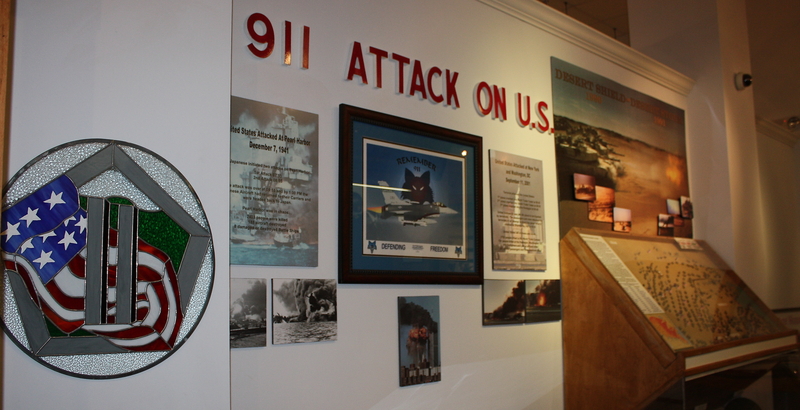 The South Carolina Military Museum includes an exhibit on the Sept. 11, 2001, terrorist attacks on the U.S.
That’s why the South Carolina Military Museum was such a surprise. The museum is tucked behind the National Guard Armory on Bluff Road and does a wonderful job of telling soldiers’ stories with a collection of implements, mostly weapons, left behind from the wars that have touched the state from Colonial skirmishes with the Spanish and local Indians to several turning-point battles of the Revolutionary War through the Civil War and up to current wars in Iraq and Afghanistan. 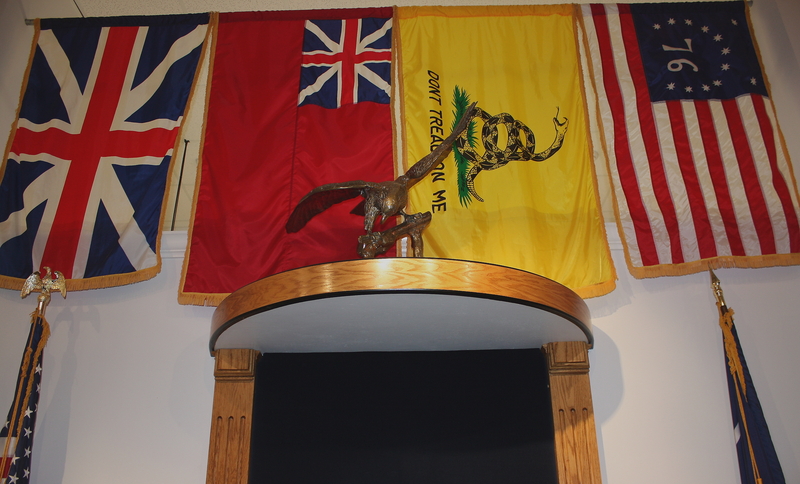 The museum has original artifacts and some reproductions that show uniforms, weapons and other items soldiers carried. The gorget was a uniform adornment that was the model for the first crescent on the South Carolina state flag. Of particular interest is a gorget, the crescent-shaped symbol of Revolutionary War soldiers from South Carolina. The symbol made its way to the state flag, where it has become shaped more like a crescent moon than the horseshoe shape of the gorget. Just a few exhibits away sits a cracked digital camera carried by a young lieutenant in the South Carolina National Guard who survived an improvised explosive device in Afghanistan. Director/curator Buddy Sturgis knows every item in the museum and can tell you the story behind each piece, which Sturgis and other guides love to share with visitors. Sturgis is not just the curator, he is the visionary behind the museum and a Vietnam veteran. He personally knows many of the heroes highlighted in the exhibits. His stories certainly make history come alive. The museum is free and open to the public. On my recent trip, I was lucky enough to tour the museum with a group of Guard members in uniform. I would allow at least two hours to see and hear all about the artifacts in the museum, which includes a few nonmilitary exhibits. 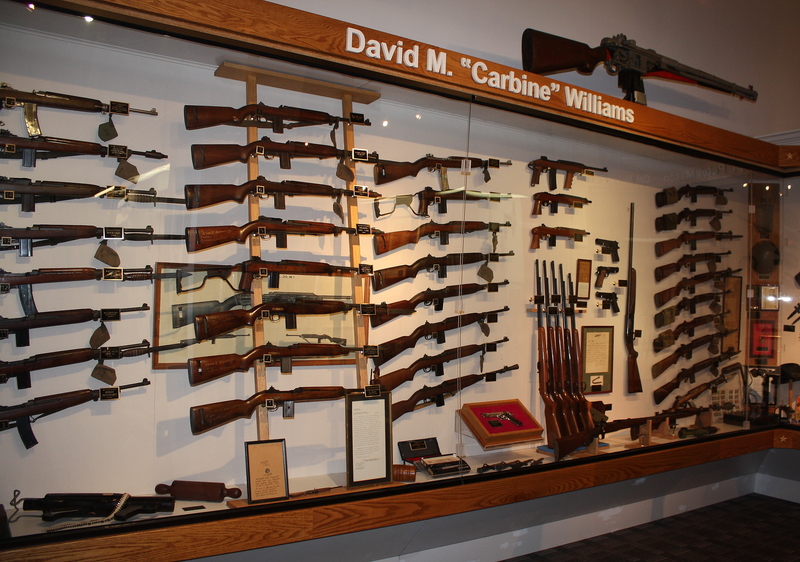 The South Carolina Military Museum includes an exhibit on the weapons created by North Carolina native Marshall "Carbine" Williams. Sturgis said the museum’s exhibit of rifles designed by North Carolina native Marsh “Carbine” Williams is one of the largest such collections around. For those who haven’t seen the 1952 Jimmy Stewart movie “Carbine Williams,” Williams was a moonshiner who was convicted of killing a deputy sheriff. While in prison, he created what would later become the M-1 rifle used by soldiers during World War II. Another exhibit looks at the life of Melvin Purvis, the South Carolina native who gained famed as the FBI agent who killed John Dillinger and later served in the Army during World War II. If you want to double-up a weekend museum visit with breakfast, I can recommend two restaurants from across the river in West Columbia. If you want to get to the museum when it opens Saturday at 10 AM, check out Compton’s Kitchen on B Avenue. You can get a wonderful Southern breakfast at better than reasonable prices. If you’re going on Sunday, the museum opens at 1 PM and you can get a wonderful brunch at 116 Espresso and Wine Bar and enjoy a short walk along the river before heading to the museum. South Carolina Military Museum (803-806-4440; scmilitarymuseum.com) 1 National Guard Road, Columbia. Open 10-4 Tuesday-Saturday; 1-5 Sunday. Closed on all federal holidays and when the University of South Carolina plays football in nearby Williams-Brice Stadium. Guided tours of the museum can be scheduled on request. Tours work best for groups of 30 or fewer. School classes are welcome, but exhibits are best enjoyed by children older than six. Although the museum is free, donations are welcome. Compton’s Kitchen (803-791-0755; comptonskitchen.com), 1118 B Ave., West Columbia. OPen 6 AM-2 PM Monday-Friday for breakfast and lunch; breakfast only on Saturday 6-noon. If you want to be sure you get to the museum at opening time on Saturday, stop by Compton’s for a great breakfast at a great deal. You can get the No. 1 special: two eggs, bacon, grits and biscuit or toast for about $4. Add in one of the nicest waitstaffs in the business and you have yourself and wonderful start to any day. 116 Espresso and Wine Bar (803-791-5663; 116state.com), 116 State St., West Columbia. Open Tuesday-Friday for dinner starting at 4 PM; 10 AM-midnight Saturday and 10-5 Sunday. This restaurant located on the “West Bank” of the Congaree River that separates Columbia from West Columbia and Cayce is a wonderful weekend brunch spot. Traditional breakfast items such as steak and eggs, quiche and French toast meet up with 116’s specialty pizzas to offer an eclectic brunch selection. Everything on the menu is full of Mediterranean flavors, plus it’s almost impossible to eat here without a stroll along the Riverwalk, which I highly recommend. This entry was posted in Dining Out, To Do and tagged breakfast restaurants, military history, south carolina museum. Bookmark the permalink. The shape on the SC flag is NOT is gorget. It is a heraldic crescent. 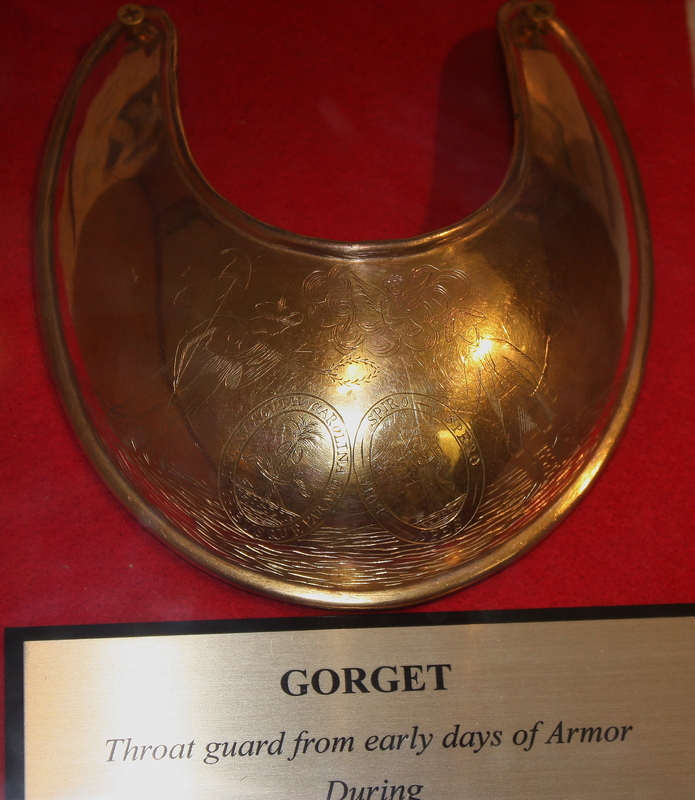 There is absolutely no evidence that it was ever intended to a gorget. See my article on the subject at http://2ndsc.blogspot.com/.